This level hard difficulty. 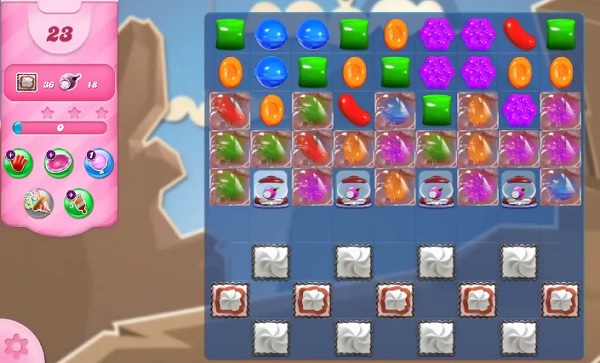 For this level try to play near to blockers and make special candy. Use more striped candy to break the time bomb. You could get more help from below video. always the same. You get 23 moves we get 18. Always you get colourbombs, we dont Our bombs start at 9 your at 18. Are you an employee of King? Why do we have only 18 moves? Why have our bombs only got a 9 move countdown? Not enough time to get bombs out to clear them. Please make some changes. Only 18 moves,thanks for understanding.Appreciate your co-operation. 18 moves. Don’t get enough bombs to win the level! I only have 18 moves…not 23 like it says here. Plus, sometimes it counts candy wraps that I have not initiated and sometimes it doesn’t. Not very fair. I used my last hammer to get the last candy wrap U needed and it did not count it. You owe me a candy wrap booster. PLEASE HELP…SEND ME A “MIRACLE BOARD”. Thank you for listening. Can’t get enough bombs with only 18 moves. Bombs start counting down at 9. What’s up Candy Crush?